Apparently G thinks this is the best meal I’ve ever made. He also says it’s not chili. I think I’ll let him be half right in that case because I’m calling it chili–so there! Taking the basic idea of an all-American chili (onions, beans, spices, tomatoes), this Indian Spiced Chili layers Indian spices like curry, coriander, cumin, turmeric, and garam masala with chickpeas, butternut squash, tomatoes, corn (all the veg from our garden or the farmers market!) and a dash of heat. While it could almost pass for something like a curry, I think it does have that slow cooked, comfort food feeling of chili–something perfect for winter. Be sure to set aside an hour or two for the chili to simmer and have vegan sour cream or yogurt on hand for a garnish–its little bit of creamy coolness goes a long way for rounding out the dish. Serve by itself or with naan or some rice and you’re good to go for a one pot, weeknight meal! In a Dutch oven or large pot, warm 1-2 tbsp olive oil over medium heat. Saute the onion for 3-5 minutes until translucent. Add the garlic, cook 1 minute until fragrant. Add all the spices (except the garam masala) and cook 30 seconds, until fragrant. Next, add the butternut squash chunks, chickpeas, tomatoes, vegetable broth, and water. Stir to combine. Bring to a boil, then lower to a simmer. Cook 1-2 hours, until the chili has thickened. Add the corn and garam masala, stir, and simmer a final 10 minutes to allow all the flavors to meld. Adjust seasonings as necessary, add salt & pepper to taste. Garnish with vegan sour cream or yogurt, serve with naan or rice. I’m in the same boat as you–beans aren’t always the nicest on my tummy either. The chickpeas seemed to work out ok though! If you’re starting with dried beans, definitely soak a day or two. Ooh this looks wonderful, Jes! I’d call it a chili! I’d call it whatever you want as long as I get to eat a bowl! Wish I could send you a box of it! 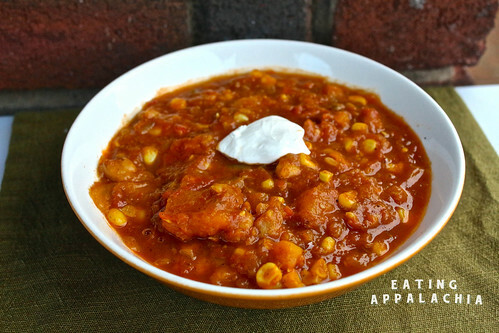 This does look really good–so hearty and spicy and clearly perfect for winter. I don’t know if I would have called this a chili, or a dal, or maybe just a soup, but as long is it’s good, I’m good too. Good timing! I have a butternut squash sitting on my counter AS WE SPEAK (or, er, type). Looking forward to trying this recipe out! Man, I love a good chili recipe! Do you think this would work in the crock pot? Would I need to pan-fry the onions and spices first, or could I just throw it all in there? Crock pot chili is one of my favorite things to make on a winter Sunday – we can eat it all week long! Oh yeah, I think this would be super easy in the crock pot. I never use mine, but I bet if you put it on low and let it go for awhile, it’d work perfectly. Oh, this looks so good! I’ve been sick, and therefore unable to eat anything beyond a safe, bland diet the past two or three weeks. Once I’m able to venture out beyond sticky rice and mashed potatoes, I’m giving this a try! Oh no! Feel better soon! Seems like everyone’s been ill this year. Sending healing vibes your way. Ooh how I love indian spices in everything. And butternut squash is such a good call! Speaking of Indian food, have you ever tried sambar? It’s a vegetable and lentil soup that I absolutely adore. If you get a chance, you should definitely try it! Sambar is fantastic! I’ve never made it though, just ordered it at restaurants. It’s definitely a recipe I should try my hand at. Wow, that is a simply super bowl of “chili,” Jes. I love the Indian spices and the addition of corn. And everything tastes better with a bit of butternut squash in there. I am definitely going to make this one for the new year. Yum! This is perfect timing, I’m going try it out tonight. I was tossing up Indian curry ideas but wasn’t feeling inspired by anything particular until coming across your recipe. I’ll have to make a few vegetable subs to fit in with what I have on hand but I definitely have all the right spices.